Our Betta Fish Care FAQ page is where we post all of the questions that our Betta experts receive from our clients. Just a quick read of all the questions and answers listed in our betta fish FAQ will likely answer any questions that you have about caring for your Siamese fighting fish. 1. What temperature should I keep my betta fish tanks at? Answer: Anywhere between 72 and 86 degrees farhenheit will do. These are tropical fish that like warm (and still) water. 2. Can I place my betta fish bowl in direct sunlight? Betta fish care FAQ Answer: No! you need to keep your betta fish aquarium away from any heat source. These tropical fish like warm water, but the temperature must be constant. They do not respond well to changes in water temperature. 3. What are suitable betta fish tank mates? Answer: Any tropical fish that likes warm unfiltered water, is not nippy and does not have long fins. Bettas will also respond well to snails, or shrimp. In general, the best betta friends (betta fish tank mates) you can find are slow moving bottom dwellers. 4. Can I keep my betta fish with goldfish? Answer: No. Goldfish require large filtered tanks and very cold water – completely the wrong conditions for a healthy betta fish. 5. Do betta fish sleep? Betta fish care FAQ Answer: Yes, when betta fish are sleeping they usually just float in a very still part of the tank – appearing to be frozen. 6. Where can I find betta fish for sale? Answer: Here! 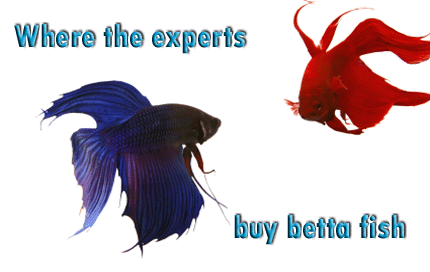 Be careful where you buy betta fish as they can have a very limited lifespan if kept under the wrong conditions. Our experts keep our live betta fish under optimal conditions. Buy betta fish from My-Betta-Fish.com and your healthy betta fish will be at your door before you know it. 7. What do I need to know about breeding betas? Answer: Bettas need to be conditioned for breeding before you put them in contact with each other. This step can usually be accomplished within a few weeks. The fish should both be put on a diet of live blackworms and/or brine shrimp. Over this period you’ll notice that the female betta fish gets a little fatter (a sign that she’s full of eggs). 8. What is the best betta fish tank? Betta fish care FAQ Answer: We get different versions of this question all the time, so we’ll try to answer it as best we can on our betta fish care FAQ. The answer really is, it depends what you’re looking for. Any of our Hagen 2 liter or 3 liter cubes will do an amazing job of creating a healthy environment for your betta fish. 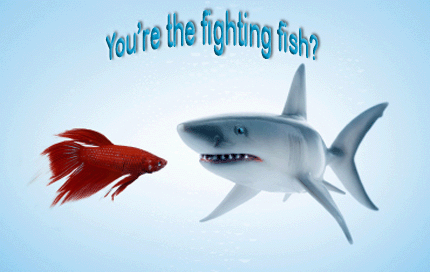 Fighting fish are much more active when they can see another betta nearby. For that reason, the Marina betta barracks which will house 4 bettas side by side is a great choice. Whatever you do, remember that bettas need warm, still water. Do not put them into a large filtered aquarium. 9. How long is a betta fish lifespan? Betta fish care FAQ Answer: The average lifespan of a healthy betta fish is 2-3 years. 10. What is the best food for betta fish? Answer: In the wild, bettas eat live bloodworms and shrimp brine. While these are okay for special occasions, your domestic betta fish should eat primarily Nutrafin Max betta food. This specially formulated food contains nutrients to keep your betta fish healthy, as well as color enhancers to keep him beautiful. 11. How much do betta fish eat? Answer: Betta fish eat very little and they should only be fed what they can eat within a minute (usually 2 or 3 flakes). Make sure to clear away any uneaten food with a small net as it will make your water cloudy. 12. What are the most common betta fish diseases? Answer: Here are some of the more common betta fish diseases: for complete information on how to recognize and treat betta fish illness see our detailed betta fish diseases page. Fungal infection: Your betta has pale patches on his head and body. Can be teated quite easily. Tail Rot / Fin Rot: tail and fins get continually shorter. Caused by dirty water. Betta Ick: Betta ick is a parasite that will result in white dots all over your betta fish. Can be treated with Aquarisol. Betta Velvet: Betta velvet is another parasite that results in your betta looking like it has been sprayed with gold dust. Can be treated with Bettazing. Betta Popeye: Betta popeye is a bacterial infection (resulting in a bulging eye). It’s usually the result of dirty water. Treat will ampicillin and make sure to clean the tank regularily. Betta Dropsy: this is a very serious betta fish illness and can be fatal. 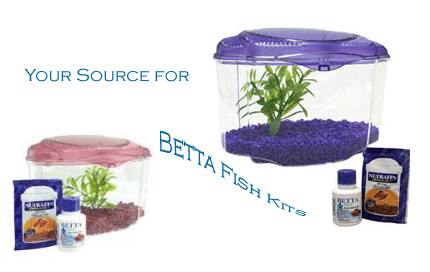 Betta dropsy is believed to be caused by feeding live food to your domestic betta, stick to Nutrafin betta max. Keep the water clean and hopefully your betta will recover. Betta parasites: Also usually caused by feeding live food to your betta. Remember that most of the live food that you find contains internal parasite that you’ll be introducing to your healthy betta fish. Betta fish swim bladder disorder: Caused by overfeeding your betta. Remember to only feed your betta what he can eat in 30 seconds to a minute. Betta Inflamed gills: This can be caused by toxins in the water or your betta may have been born with a defective gill. You’ll notice that his gills do not close all the way, making breathing difficult. Treat with clean tank water and ampicillin. This betta fish care FAQ contains a list of the most common betta diseases. 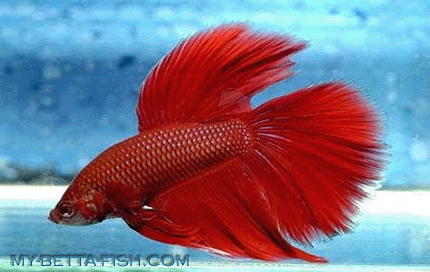 For detailed information on symptoms and treatment please read more about betta fish diseases. 13. Does my betta fish breathe air? Answer: Yes, bettas are labyrinth fish and they breathe air from the surface of the water as humans do. 14. What size betta fish bowl should I buy? 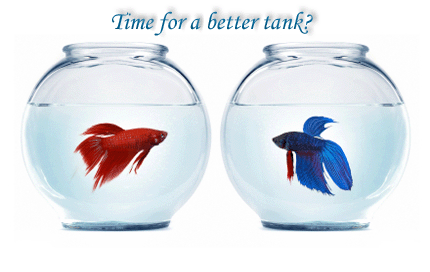 Answer: Because bettas breathe air from the atmosphere they are not as dependent on oxygenated water from the tank. They like calm water and any good betta fish tanks over 2 liters (half a gallon) will do. 15. Can my betta jump? Yes, bettas are excellent jumpers so do not fill the water right to the top of your betta tank as they may jump out. 16. Can I keep more than one betta together? betta fish care FAQ Answer: No, bettas are called fighting fish for a reason. They are very territorial and will fight with other bettas. 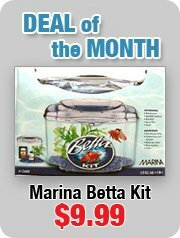 Use the Marina Betta Barracks, this divided betta tank allows you to keep them side by side while keeping them separate. 17. Is my betta male or female? Answer: male bettas are usually much more colorful. The males also have longer bodies and fins and their rear fin is pointed more. 18. How do betta fish mate or breed? Answer: Once they have been completely conditioned for breeding, the male betta basically hugs the female and squeezes the eggs out of her. He then fertilizes the eggs. If you’re thinking about breeding bettas make sure to do your research. This can be very rewarding but requires several steps and requires that you know all the ins and outs of breeding bettas. Hopefully, we were able to answer your betta question in our betta fish care FAQ. If you didn’t find your answer here, we’re sure that you’ll find it elsewhere on our site. You can also contact us with your questions and one of our betta experts will get back to you. 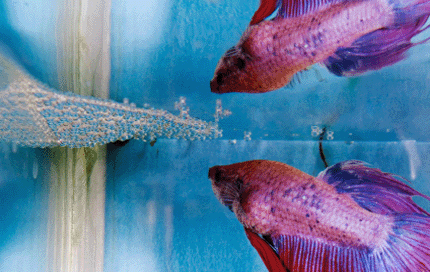 With a little loving care, preventing betta fish diseases is pretty easy. The most common source of betta fish illness is dirty tank water. The entire tank water should be changed regularly to ensure your betta isn’t swimming in toxins. Tank water tip: To make your tank water last longer, ladle out 500 ml every few days and replace it with read more. This Betta FAQ is awesome. I have this page bookmarked and every time I’ve had a question about my betta, I’ve found the answer here. Thanks for the great site! I took your advice about what betta fish food to use and my betta has never been more active or beautiful.